Proposals are used by almost every professional customer service provider. The primary purpose of making the proposal is to create satisfied customers who stay loyal to you. No matter what your business goals are, a service proposal will always help to achieve them. What is a service proposal? It is a type of proposal which is written by a service provider when he wants the prospective customer to avail his services. The services and their types are briefly explained in the proposal. In other words, a service proposal is a type of communication channel between the service provider and his prospective customers. The use of a service proposal is vital for any service provider in order to put the best impression on the clients especially those who have never availed your services before. There is a huge competition nowadays that every individual has to face. The clients are more likely to choose those service providers who are able to provide them with the best services. The quality of work done by any professional is usually measured by the proposal. A professional with a winning proposal will get more offers. Thus, writing a proposal is not substantial for a service provider. He is required to write a proposal that has the ability to stand out. Here are a few tips that you should keep in your mind while writing a service proposal. A service proposal should never be too long. Keep it concise and brief. It is not the length that makes your proposal successful. However, the length can completely get your proposal rejected because no one has plenty of time to read long proposals when lots of proposals are there in line competing with each other. Make sure that you provide complete information but in a concise manner. The format and structure of the proposal should be kept into consideration while writing the proposal. The proposal should be formatted in such a way that it can easily be read by the client. Use bullets, headings and other ways to increase the readability of the content included in the proposal. Make sure you give your personal views about the service your client wants to achieve. For example, if you are a painting service provider, you can mention in the proposal that which type of paint will be more appropriate to use. With the help of a proposal, the service provider can make his services reach the customers who want to avail them. If a service provider has something special about the services he provides, he can mention the specialty in the proposal. Since the primary goal of writing the proposal is to communicate with the clients, the proposal effectively meets the needs of communication of a service provider. The service provider can impress the clients by writing a professional looking service proposal. In this way, a service proposal becomes the best marketing tool. 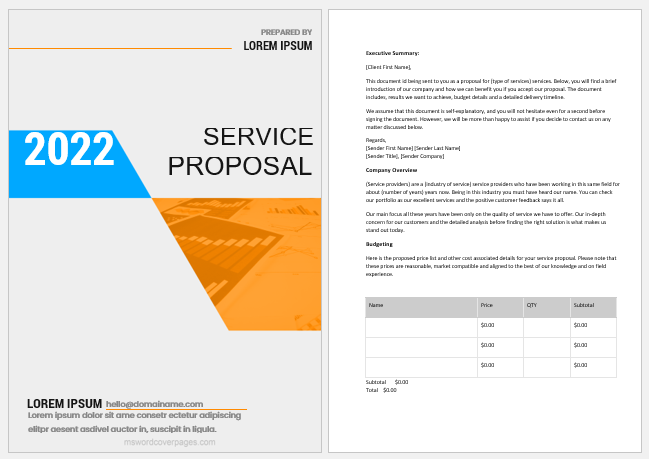 This document is being sent to you as a proposal for (type of services) services. Below, you will find a brief introduction of our company and how we can benefit you if you accept our proposal. The document includes results we want to achieve, budget details and a detailed delivery timeline. We assume that this document is self-explanatory and you will not hesitate even for a second before signing the document. However, we will be more than happy to assist if you decide to contact us on any matter discussed below. (Service providers) are an (industry of service) service providers who have been working in this same field for about (number of years) years now. Being in this industry you must have heard our name. You can check our portfolio as our excellent services and the positive customer feedback says it all. Our main focus all these years have been only on the quality of service we have to offer. Our in-depth concern for our customers and the detailed analysis before finding the right solution is what makes us stand out today. Here are the proposed price list and other cost associated details for your service proposal. Please note that these prices are reasonable, market compatible and aligned to the best of our knowledge and on-field experience. We believe that timely delivery is everything that is why we organize and plan everything from the start. Below you will find a table in which are planning for your project is mentioned. By signing this proposal, you agree to all the conditions and pricing that is being mentioned in the document. On receiving this signed proposal back, we will dispatch a formal service agreement as soon as possible. However, if there are any terms you deem negotiable, do not hesitate to contact the person whose details are mentioned at the end.